Here is another great (and inexpensive) course on sale during Udemy black friday special. This one is to help you learn how to reskin a candy crush like iOS game! Remember, each day the course goes up in price and on 28th November it changes back to its original price! So this is a genuine and HUGE discount. The price will vary between $10 and $20 depending on what day you get there. So get in early and buy any courses you were considering and save a ton of money! NOTE: Clicking the button below will take you to this course on Udemy’s website. Once you get there, you can use the “Search filter” to find other Black Friday courses on special. There is a ton of them in almost all categories! Remember you have lifetime access to these courses, including all course updates once purchased! Here is the details of the course direct from the udemy page. 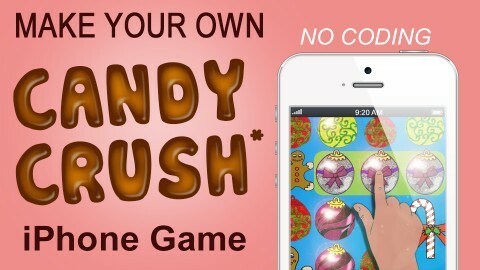 A-Z guide to help you publish your own Candy Crush inspired iPhone game mechanics in a day. Source Code included. This course’s main objective is to become the go-to source for anyone willing to enter the iPhone app industry. The course starts with us in front of a regular Apple computer (or MacInCloud for PC users) and I will guide you through all the step necessary to set up your computer for development. I will also go through each steps to become a licensed iOS developer. We will then install the game from the source code(included with this course), run the game on the simulator, then modify the graphics and sounds to customize the ‘match 3’ game into one of your own. Then we will setup three advertising channels to ensure money coming in. Then we will publish the game to the Apple app store. This course is not about theories. Once you complete this course, you have a real product of your own in the app store, bringing in profit. You can’t pass this opportunity. There has been plenty of reskins of these apps by myself and by many students. Remember also, to see other “Black friday” specials on Udemy, click the “Black Friday” filter selection in the search area – You will find a ton of bargains there!